Video games are a tough hobby to get into. In addition to being brutally expensive and impossibly time consuming, they’re also inherently inaccessible to a lot of people, as the physical demands of modern games and controllers are often too much for players with limited mobility. 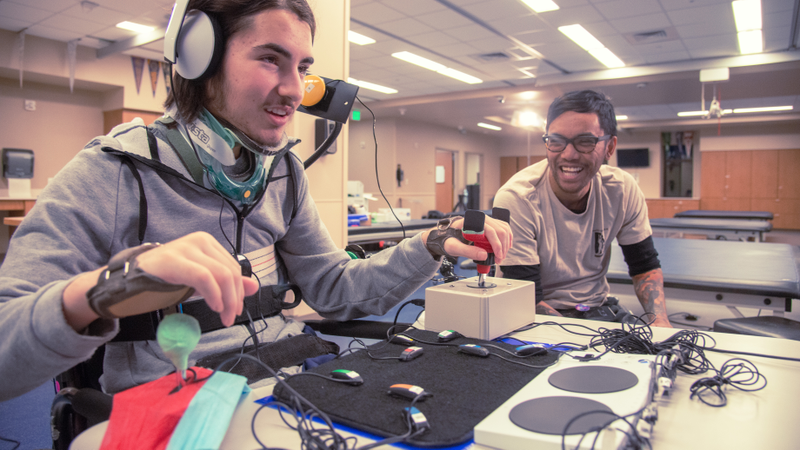 It’s an issue that’s become more visible in the last decade, as non-profit organizations like AbleGamers were established to help provide custom controllers to people with disabilities and console manufacturers started developing accessibility options like the ability to remap all the buttons on a controller. Microsoft announced today that it’s taking a big, important next step in improving video game accessibility by being the first console maker to introduce a controller specifically designed for players with limited mobility. Compatible with both Windows PCs and Xbox consoles, the Xbox Adaptive Controller, as the company is calling it, doesn’t look like much on the surface—just a slate designed to sit on a table or lap or floor that sports an enlarged d-pad and two big buttons that are easier to press than the tiny bubbles of a standard Xbox controller. The real idea here is that the controller acts as a hub for a broader range of pre-existing accessibility-focused controllers that people can mix and match to suit their particular needs. The back of the hub is covered in 3.5mm ports—a format that’s become a standard for gaming accessibility devices—corresponding to each button on a traditional Xbox controller. The player can assign each one to everything from larger buttons to foot pedals to breath-operated joysticks, reconfiguring everything to their needs and the demands of whatever game they’re playing. It’s easy to look at something like this and write it off as a massive corporation trying to corner a market or land easy goodwill, but this is a vital step to making video games more inclusive. The options that are out there right now for people with limited mobility require either huge monetary investments or the assistance of non-profits. This new controller isn’t a cheap option either, costing $100 on its own plus the price of any other assistive devices the player needs, but it helps to eliminate a huge hurdle—building the technological guts that bring these various pieces together and connect them to a console—and hopefully can kickstart the process of making accessibility solutions more readily available to anyone who needs them.